The TASER M26C Gun Pistol is a legal open carry / concealable self defense weapon. It has the power to incapacitate even the strongest and most aggressive attackers. Built on the same technology that the military and law enforcement officers use, the M26C is an extremely powerful self defense weapon that puts the power in your hands. It shoots a 15 foot electrical shock cord to freeze your attacker in the spot. This cord can pierce skin, clothing, and thick materials. Once activated the bad guy won’t be able to move and most likely will fall down in place – giving you plenty of time to get to safety and call the police. 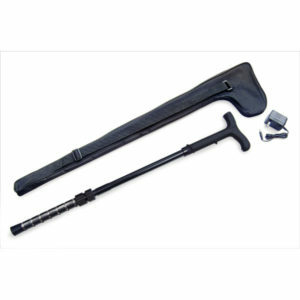 The M26C is a serious self defense tool that can save your life and your families. If you are ready to take control of your protection – the M26 is a great start! Let your attacker know you’re not someone to mess with even at a distance. A reliable TASER can be easily used on your target even if they are still approaching. Less-lethal self-defense has recently been taken to a whole new level – the TASER energy weapon. Police departments throughout the United States are starting to deploy TASER energy weapons for their duty officers. It has been proven that TASER weapons are far more effective than any other self-defense weapon on the market today. 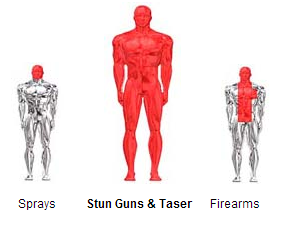 TASER uses the powerful Electro-muscular Disruption (EMS) technology. 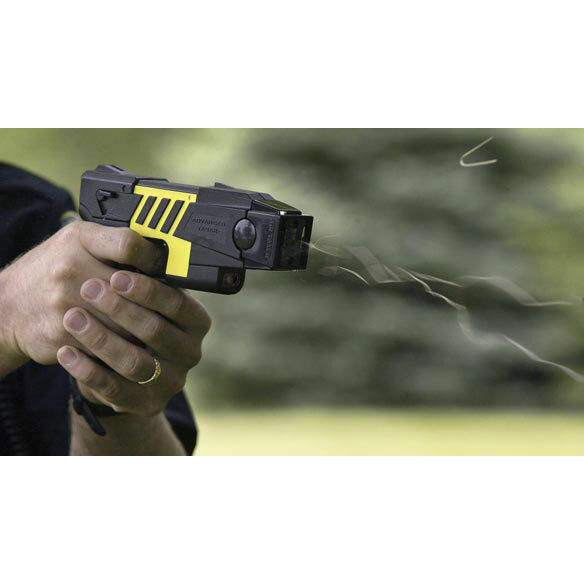 TASER delivers a powerful 18-26 Watt signal that completely overrides the assailant’s central nervous system and directly controls their skeletal muscles. 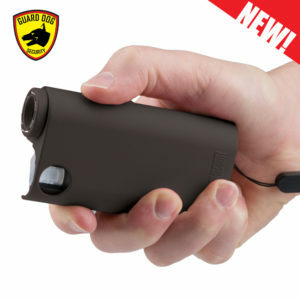 Unlike the stun gun, when the probes touch the assailant’s body, it causes immediate uncontrollable contraction of the muscle tissues. 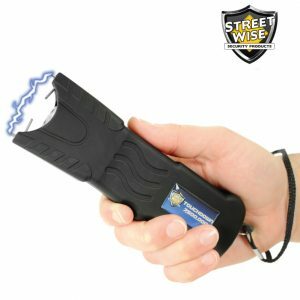 While a determined assailant who has a high tolerance for electrical stimulation can fight through the 17-14 Watt stun gun, the assailant hit with the TASER has no choice but to fall down regardless of mind power and body strength. You can take down anyone who is bigger and stronger than you by simply pulling the trigger. 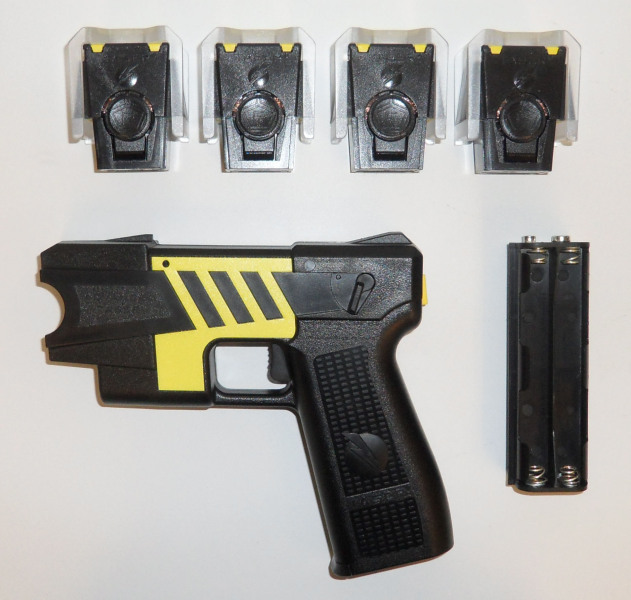 Pull the trigger and the TASER will shoot two small probes up to 15 feet to the assailant. A 15 foot range provides a great distance from you to the assailant. This can significantly reduce the chance of injury by avoiding a close confrontation. You don’t need any permits to own it. TASER is not considered a firearm — they’re legal to carry in most states without permits (including California). Prohibited from citizen use in IL, MA, RI, NY, NJ, WI, MI, HI and certain cities and counties. Legal but with restrictions in CT, FL, IN, NC, ND, OH and WA. Power supply: 8 AA Duracell Ultra Alkaline batteries or Energizer Nickel Metal Hydride rechargeable AA batteries, self contained inside polyethylene battery tray, with reverse insertion prevention feature. Aiming mechanisms: Fixed front and rear “fin and blade” sights, 650 Nanometer wavelength, laser sight (optimized at 13 foot range). Housing: 7.5L x 5.5H x 1.3W (inches). Battery indicator: High visibility red LED calibrated for alkaline batteries. Yellow coloration kit: Left and right side yellow polycarbonate decals with P.S.A. that adheres to sides of the weapon, in order to mark it as less- lethal. Don’t delay. Your safety is Priceless! What is the difference between M18L and M26C? None. The manufacturer rename M18L to M26C in 2009. They are the exact same unit.How does the background check work? We will do the background check for you before processing the order.I have a felony record, does that mean I cannot purchase a Taser? We can perform a background check for you with the manufacturer for free before we process your order. If you pass, you can go ahead and order and if you don’t, it won’t cost you anything and you have nothing to lose.How does the background check work? We will do the background check for you before processing the order.How long does the background check take? It should take less than 24 hours.How long would the air cartridge last if it is not in use? 5 YearsWhat kind of battery does the TASER M18L/M26C uses? Eight AA BatteriesHow do I learn more about TASER? 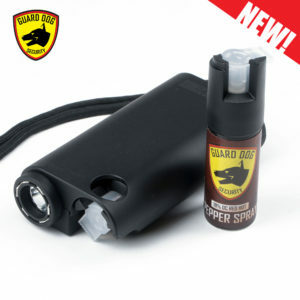 You may visit our detailed FAQ section or First Timer’s Guide to Stun Guns & TASER Devices for more information. If you cannot find the answer to your question, please feel free to contact us at 1-866-321-7886, our TASER specialist will further assist you.How does a TASER device work? Upon firing, compressed nitrogen projects two TASER probes up to 15 feet at a speed of 180 feet per second. The probes are connected by thin insulated wire back to the TASER device. An electrical signal transmits throughout the region where the probes make contact with the body or clothing. The result is an instant impairment of the attacker’s neuromuscular control and severely impaired to perform coordinated action. The ADVANCED TASER M18L uses an automatic timing mechanism to apply the electric charge for 5 seconds enough time for you to flee the area and get to safety. How can the TASER system be so effective yet be generally safe? TASER technology does not depend upon impact or body penetration to achieve its effect. Its pulsating electrical output interferes with communication between the brain and the muscular system,resulting in loss of muscular control. The electrical pulse from TASER devices It overstimulates the nerves that control muscle movement it affects them in their natural mode. The TASER is like a remote control that takes away the ability of the target to control his own body – but it does so with minimum violence or injury because it uses a communication mechanism rather than relying on physical injury. The electrical output from TASER devices is well below the levels required to cause cardiac arrest, or to physically damage an implantable cardiac device. High voltage, in itself, is not dangerous. One can receive a 25,000-volt shock of static electricity from a doorknob on a dry day without harm. The physiological effect of electrical shock is determined by: the current, its duration, and the power source that produces the shock. The typical household current of 110 volts is dangerous because it can pump many amperes of current throughout the body indefinitely. Remember that the household wall outlet is connected to massive power plants with virtually unlimited power output capability. 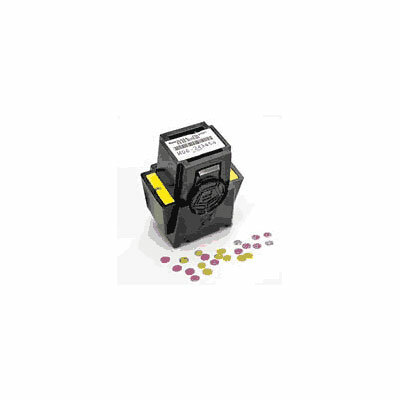 By contrast, the ADVANCED TASER power supply consists of 8 AA alkaline batteries capable of supplying 26 watts of electrical power for a few seconds. A person hit with a TASER device will usually fall to the ground and may feel dazed for several seconds. Generally, recovery is fast and the effects stop the very instant that the M18 TASER device shuts off. Some will experience critical response amnesia and others will experience tingling sensations afterwards. The pulsating electrical output causes involuntary muscle contractions and a resulting sense of vertigo. It can momentarily stun or render immobilized. Some individuals have experienced athletic type injuries and injuries from falls. Although designed to maximize safety, the TASER is not risk free and should not be used lightly. No. The electrical current will “jump” up to 2 inches as long as both probes are attached to clothing or skin. At most, only the 3/8-inch needlepoint will penetrate the skin. 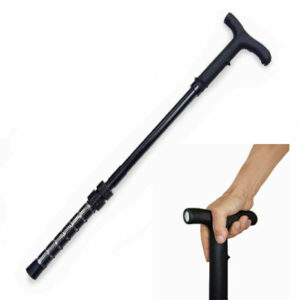 Both probes need to be within a cumulative 2 inches of the body to stop an attacker (e.g. if one probe is touching, the other can be up to 2 inches away, or each probe can be one inch away – the total spark distance is a maximum of 2 inches for both probes together). Basically, no matter where you strike the attacker, both probes have to be within 2” of the body cumulative (think of the probes being away from the body), not 2” away from each other. This was the reason the TASER is 50,000 volts; if someone is wearing a thick jacket the current and the T wave will still “jump” to the subject. The TASER system can work if one probe hits a human and the second falls on grass or dirt as the power may connect through the ground. However, the results depreciate substantially if the second probe lands on concrete, asphalt or not all on wood floors. 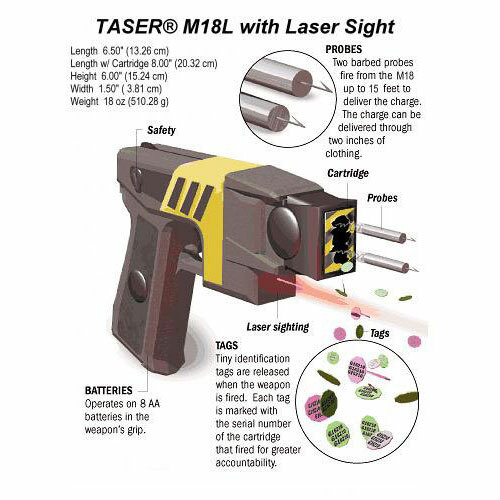 If the probes miss, the M18 TASER device can be used in a touch-stun mode by aggressively touching the front of the device to the target. The user is thus provided with two backups. A secondary Cartridge holder is available that holds a backup cartridge below the TASER’s handgrip. A final backup if the probes miss the target is the touch stun feature. Should the user miss or engage a second attacker, the ADVANCED TASER device can applied directly to the target and it will work like a powerful touch-stun device. As long as the spread of the probes is at least four inches, the TASER device should be extremely effective. 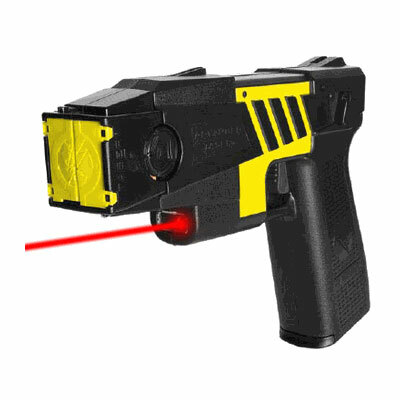 To ensure that the spread is greater than four inches, the ADVANCED TASER should be fired at a target several feet away. The optimum shot is from seven to ten feet away form the target to achieve maximum effect using a 15-foot cartridge. 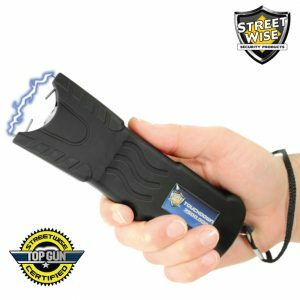 Although the TASER has been found to have a high degree of effectiveness, it is not a “magic bullet.” You should always have a backup plan and be prepared to use the touch-stun capability in case you miss the target or do not get both probes within the required 2-inch cumulative arc limitation. Work the night shift at a company that receives alot of buisness. First day of the job i was in a life or death situation without any protection. One of my fellow guards had a C2 model on him and may be the one reason i’m able to type this. I decided to buy this one for use when i’m working, and it’s saved me from injury many times. I also carry a C2 when i’m not working. i would recommend this to all of my agents . I was really surprised about how well this works! I thought that it would be a bit tricky to hide in my purse but it’s easy to get to and comes out quickly making me feel a lot safer walking to my car at night. This taser is the best on the market. I like how it comes with a practice target so i can work on using it. I also like that it is very light weight and easy to carry around my house. The wires go about 15 feet which is goood for my uses.